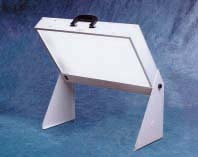 SunRay Light Box | BioBrite, Inc. This well-tested, classic design provides 10,000 lux (at 12″) of broad spectrum, UV free light over a large surface area. With built in stand and rugged aluminum construction, the SunRay will give you years of convenient service.